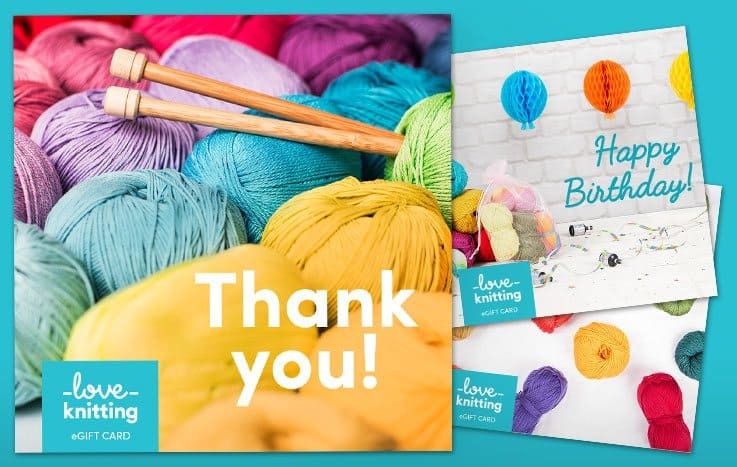 At LoveCrafts we believe that the joy of making is for everyone, from every race, culture, and every part of the world. 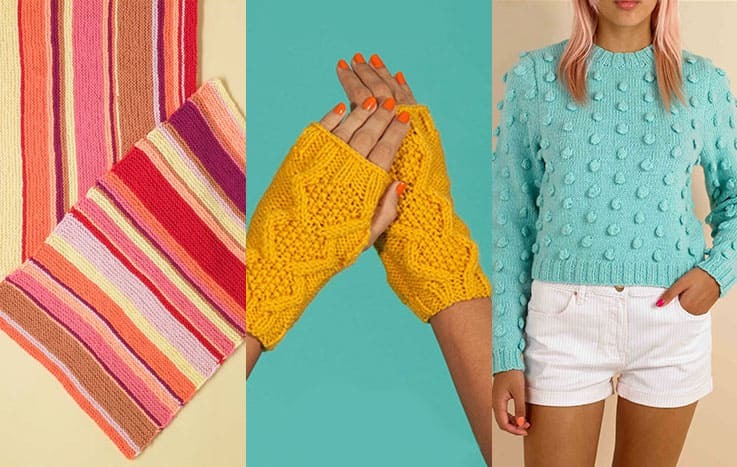 We knit, we crochet, we make, we love. 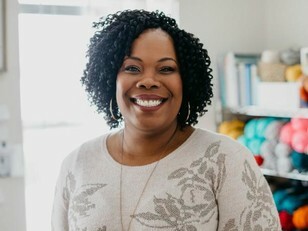 However, we and many other voices within the crafting community have become painfully aware that people of color are underrepresented in the current crafting community, and that their history is also not adequately documented. 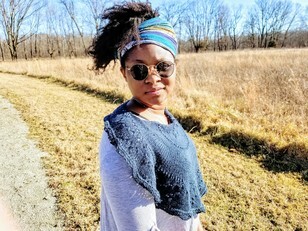 To commemorate Black History Month, we look back at crafting in the BIPOC (Black, Indigenous and People of Color) community and celebrate today's wonderful makers and their stories. 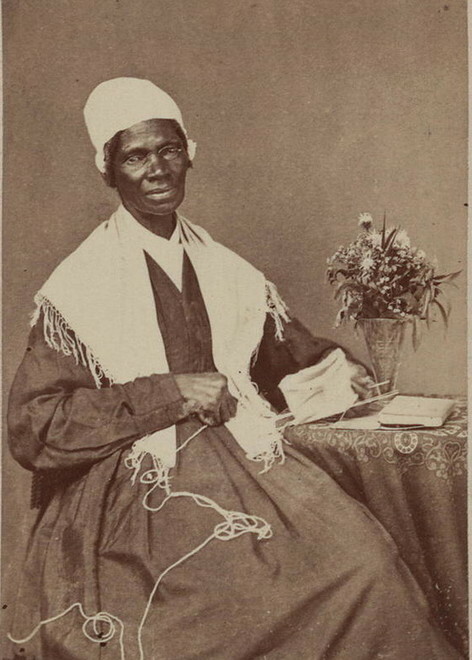 Maybe the famous photograph of former slave, activist, and abolitionist, Sojourner Truth sitting tall and proud, with knitting in hand has made its way into your life. Or perhaps you’ve heard of botanist and pioneer of recycling, George Washington Carver whose crochet was as delicate and intricate as the ecosystems he loved to study and preserve so dearly. 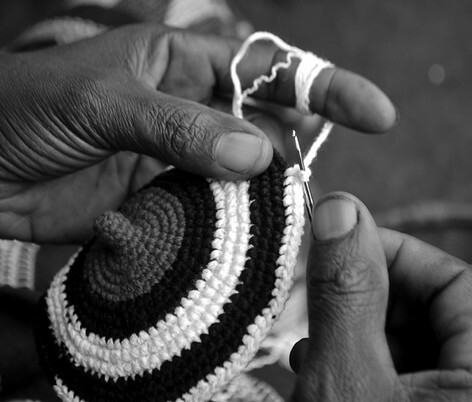 However, if like us, you have searched for the stories and lives of black knitters and crocheters documented throughout history, you will have come up short (and it's not because these stories don't exist). 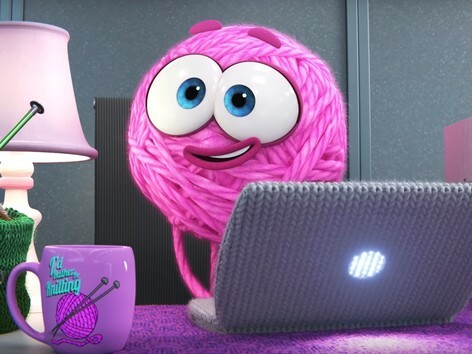 If you’ve read articles about knitting in the American Civil War, WWI, and WWII, you would have noticed that significant moments in history are ignored and therefore show a complete lack of diversity. It is only through tiny snippets here and there that we have found out many black women during those wars were unable to join the white knitting societies (started to keep soldiers in warm socks and jumpers), and so had to start their own. And not only this, that black soldiers weren’t given the luxury of receiving these items when their white counterparts readily were. Diversity in the making community needs to be intrinsic, not superficial tokenism. February has been a powerful, provocative and enlightening month in the crafts world. We wanted to take a moment to reflect on some of the things you’ve been sharing for Black History Month. The blog post shares the true story of the Glass’ great grandmother knitting for black soldiers during WWI, after discovering that the Red Cross at the time were decidedly only sending handmade goods to white soldiers. 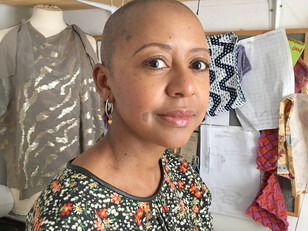 One of our favorite knitwear designers, Jeanette Sloan wrote for Knitting Magazine about diversity in the crafting world in her guest column, ‘Black people do knit’. 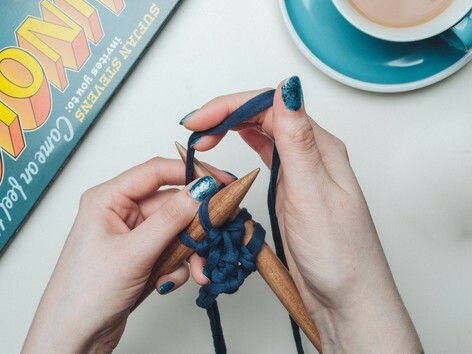 This post highlights the lack of diversity in the knitting community and that more black knitters and knitwear designers – because there are plenty – need to be not just shown in the knitting community as an act of tokenism, but truly ingrained. 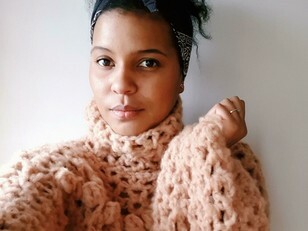 Jeanette has a section on her blog dedicated to black designers and crafters, which we think is an essential read. 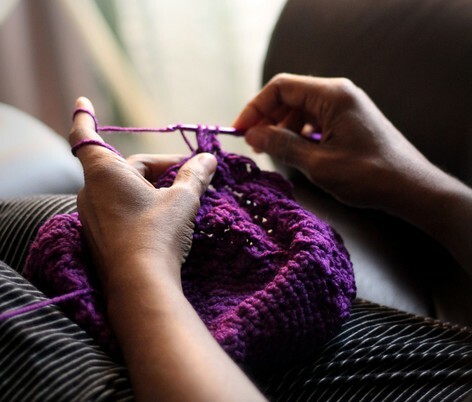 In Jeanette Sloan’s column, Lorna Hamilton Brown’s dissertation, ‘Myth: Black People Don’t Knit’ has consistently been referred to as a significant source. 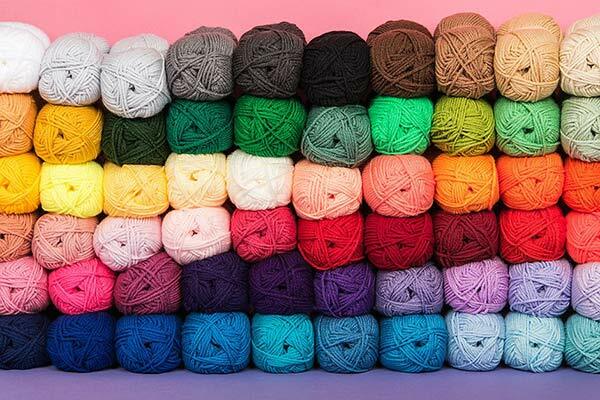 This wonderful piece of academia discusses the importance of documenting the experiences of black knitters now and throughout history. Next, we heard from Celeste Scott. 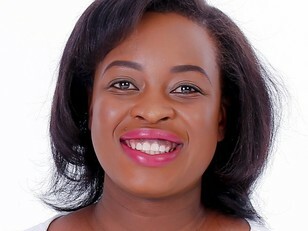 A writer based in LA, writing about her experiences as a black female, growing up surrounded by white or light-skinned black models that are ‘palatable to white consumers’ in fashion media. Scott identifies the importance of showing true diversity in the fashion industry not just for people of color, but anyone who feels as though they are not being represented. 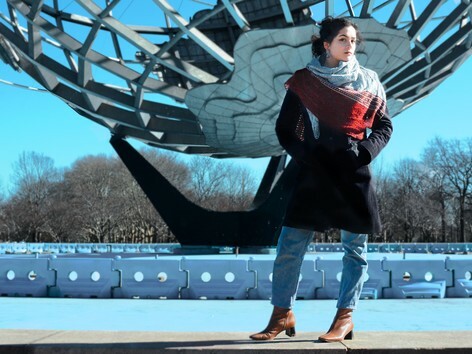 Scott has also written a roundup of sustainable fashion brands owned by women of color, which is another great read and resource. This article by Leah Faye Cooper interviews 4 of Coveteur’s fashion insiders on the significance that Black History Month holds for them. 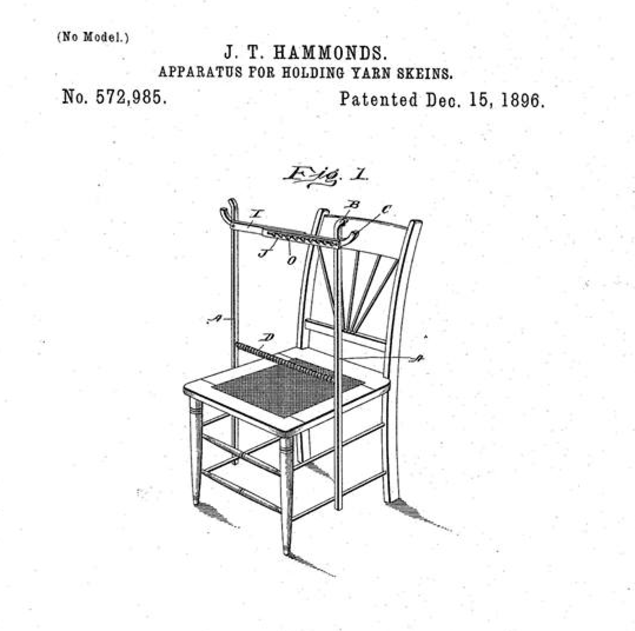 In 1896, Julia Hammonds became one of the earliest black female inventors when she was issued a patent for her yarn apparatus. 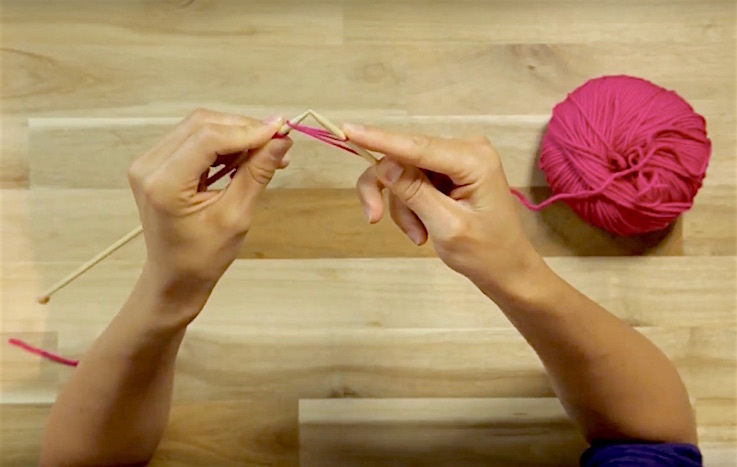 Hammonds’ invention was created for knitters and crocheters to hold and wind yarns, silk, cottons, and other fibers easily without the help of another person. Garrett Morgan was a man of inventions. After opening a sewing machine repair shop in the early 1900s, Morgan developed the belt fastener for the sewing machine, and applied for a patent for an improved sewing machine design. We’re loving the Meet Makers of Color instagram where fabulous makers of color are showcased every few days. This page is the one to follow if, like many of the makers in our community, you’re looking to diversify your feed and your makes. 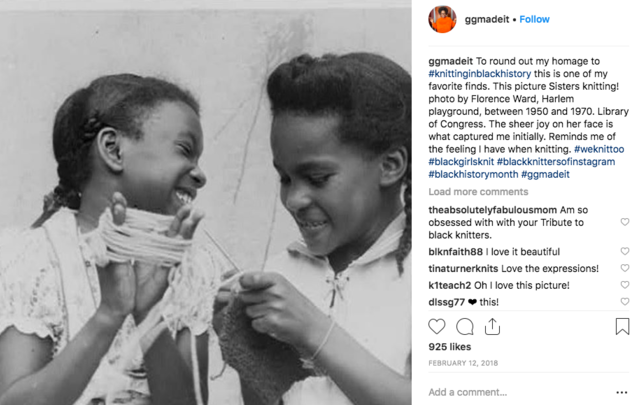 Knitter and lover of all things orange, Gaye Glasspie spent last Black History Month, sharing beautiful photos of black knitters throughout history on her popular Instagram page. 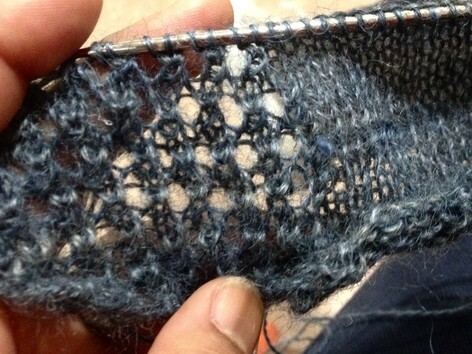 Glasspie even has a fabulous Pinterest page, African Americans knit too that showcases knitting in the black community. 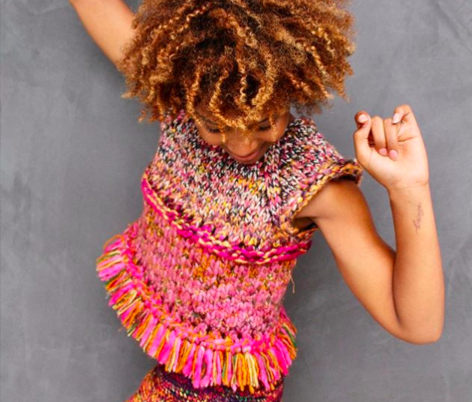 We’re loving the joyful work by knitwear designer and maker, Chasten Harmon. 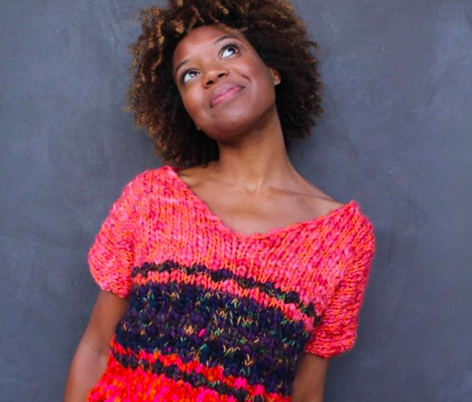 Harmon's knitwear is bright, colorful, and so smile-inducing that we had to share it. 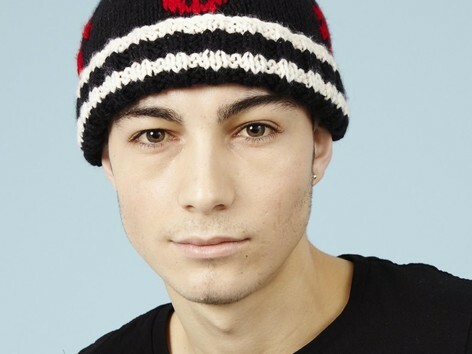 Bold hues and chunky textures give Harmon's knitwear its delightfully unique beauty. 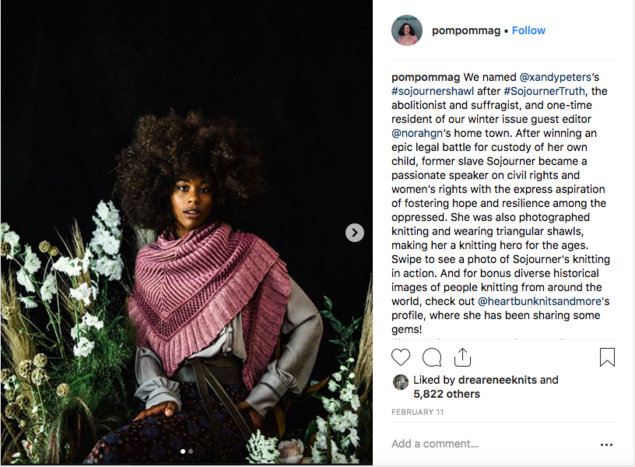 Pom Pom magazine has released this beautiful and intricate Xandy Peters shawl and named it after Sojourner Truth, who is a hugely significant figure from American history, and also a well-known knitter, so a legend in the knitting community as well. If you happen to be in New York this February and March, the Maggi Peyton Gallery will have The Journey exhibition on display. The Journey centers around the ethnicity, history, connection, and social justice through the medium of contemporary quilt art. The New York Public Library Schomburg Center for Research in Black Culture are currently holding a photographic exhibition entitled ‘Crusader: Martin Luther King Jr.’ which documents some of King’s lesser seen moments of work, travel, celebration. At the Frye Art Museum in Seattle, you’ll be able to see the work of Tschabalala Self who’s practice examines race and gender. Primarily, Self’s bright and exuberant multi-layered works are centered around the black female body in contemporary culture. Combining the best in music and art, Black Love Experience is an event that celebrates artistry, inventiveness, and all things creative from the black community. This event is a true celebration that is all about community and togetherness. We always love to celebrate designers and makers, and this month has been no exception. 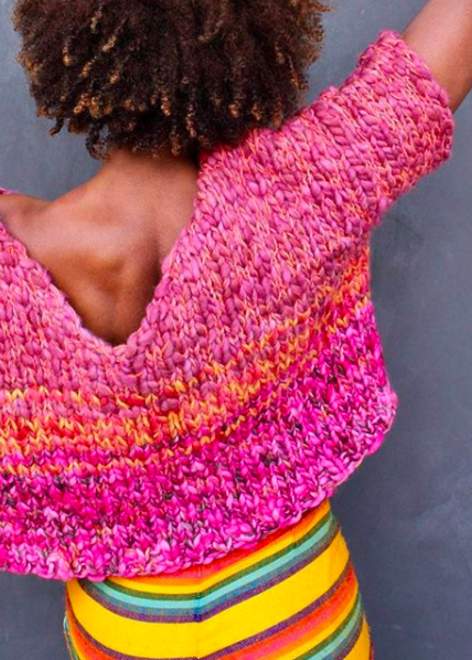 Here are some of the BIPOC makers in our community and a roundup of some of their gorgeous patterns that we’re obsessed with.